Gallia Academy senior Gage Harrison (33) catches the ball on the wing, during the Blue Devils’ home-opener on Dec. 5 in Centenary, Ohio. PEDRO, Ohio — Talk about a terrific Tuesday. 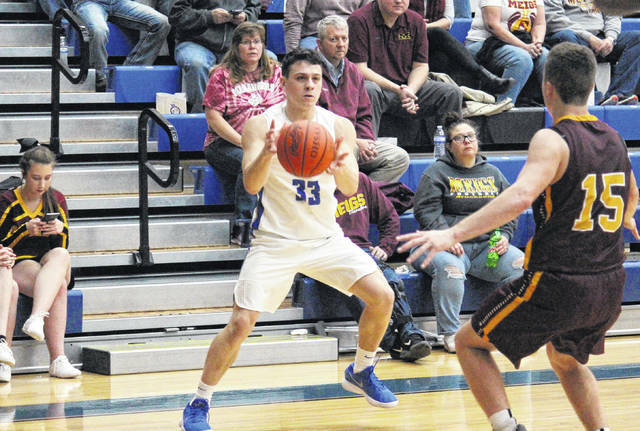 The Gallia Academy boys basketball team had 11 players reach the scoring column on Tuesday evening in Lawrence County, as the Blue Devils defeated Ohio Valley Conference host Rock Hill by an 82-35 margin to remain unbeaten on the year. It was a tight game in the beginning, with Gallia Academy (4-0, 1-0 OVC) leading the Redmen (0-4, 0-1) by a 14-12 edge at the conclusion of the first quarter. The Blue Devils allowed just 12 points over the next two periods, however, as they broke the game open. On the strength of eight field goals, including a pair of three-pointers, GAHS poured in 21 points in the second quarter, making its lead 35-18 at halftime. The Blue and White extended their advantage to 59-24 headed into the finale, with senior Justin Peck accounting for 13 of Gallia Academy’s 24 third quarter points. The Blue Devils put the final touches on their 82-35 victory with a 23-11 fourth quarter run, sparked by a quartet of three-pointers. With four players scoring in double figures, Peck led the Blue Devil offense with 17 points on eight field goals and one free throw. GAHS sophomore Zach Loveday was next for the victors, scoring 13 points on five two-pointers and one trifecta. Gage Harrison sank a quartet of three-pointers en route to 12 points, while Bailey Walker contributed 10 points, all of which came in the fourth quarter. Kaden Thomas scored nine points in the victory, Evan Wiseman added seven points, while Caleb Henry and Logan Blouir chipped in with four apiece. Cole Davis contributed three points the guests’ cause, Cory Call came up with two points, while Justin McClelland rounded out the team total with one marker. In addition to Harrison’s four three-pointers and Loveday’s one, Davis, Walker and Wiseman each had one triple in the win. Logan Haskins led the Redmen with seven points, followed by Garrett Miller, Braden Stamper and Kaden France with six each. Cody Roberts scored four points in the setback, while Isaac Floyd and Jake Blagg marked three each. From beyond the arc, Miller made two shots and Haskins drained one. From the free throw line, Gallia Academy shot 12-of-16 (75 percent) and Rock Hill shot 8-of-13 (61.5 percent). GAHS will go for the season sweep of RHHS when these teams meet in Centenary on Jan. 23. The Blue Devils return home for their next contest, welcoming Ironton to Gallia County on Friday.